I’d like to apologize for the spacing on this post being so wonky. It was fine at first, then it got all out of whack and no matter what I try, I cannot get it fixed! Finally… the long awaited tutorial on how I stack cakes. I cannot tell you how many times I tried to do this post. First, my only tiered cake order one week got canceled. Then my camera battery was dead the next time I planned it. Then it was a rainy dark day and the pictures were all too dark. But last Thursday, it all came together. After all that, I feel like the tutorial is going to be sort of anti-climatic. But if nothing else, you’re getting a truck-load of pictures in this post!! I hope you won’t all be disappointed. 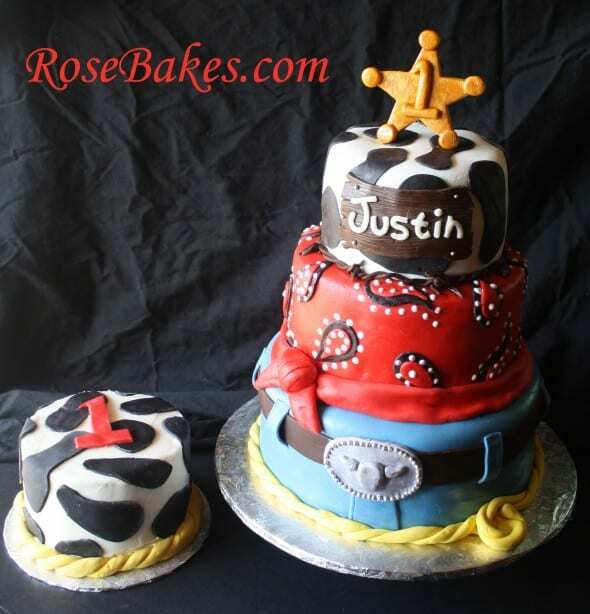 I’ve also done other cowboy cakes… that’s been a hot theme for the past couple of years. Remember Tucker’s Cake? He’s my nephew… what a sweetie!! 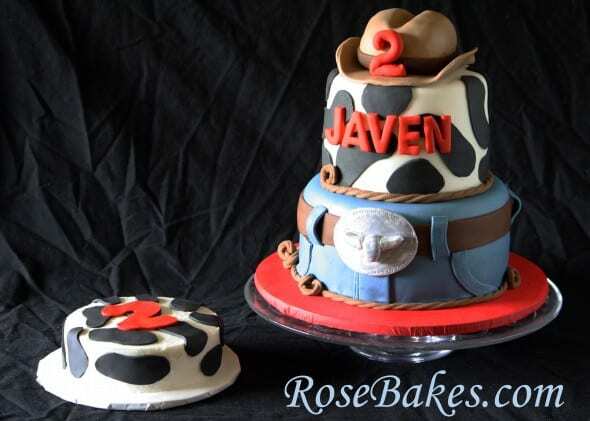 There was also this 3 Tiered Western Cake with Smash Cake… I loved it!! 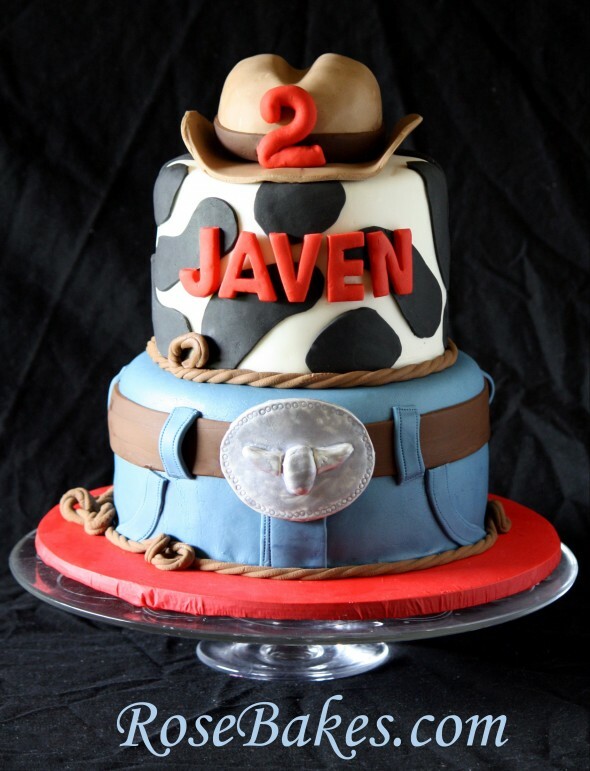 Anyway… obviously, cowboy cakes are trendy and popular… and super cute! Now that I’ve showed off all my cowboy cakes, let me show you how I stack those babies! For starters, be sure you have nice level baked cakes, and that they’re frosted, filled and covered in fondant (if applicable). 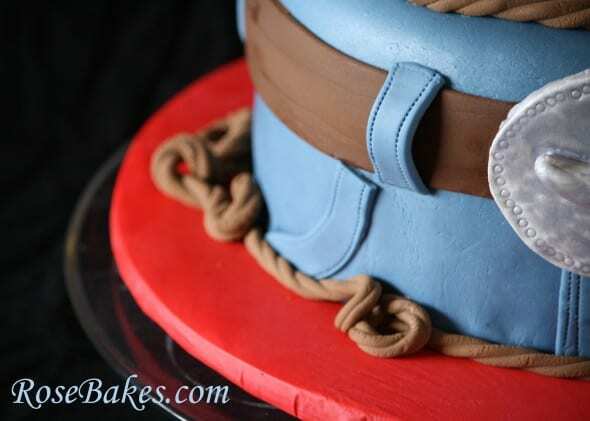 I also show a little more about the covering with fondant in this Exloding Cake tutorial! Note: If you’re stacking buttercream cakes, you can definitely glean some tips here, but you may need a more specific tutorial (which I don’t have… sorry!)! For fondant covered cakes, I like to have the tiers decorated before stacking. (as much as makes sense… there are some things that obviously will need to wait until after stacking). Also, I have all of my tiers on cardboard rounds that are the exact size of the cake. So while you can’t see it, just know that the 6″ round cake we’re about to stack has a cardboard round on the bottom of it. Here are my two mostly finished tiers. You can see that the hat on top is missing and the belt buckle. Since those were made separately, I wanted to attach them near the end – so they wouldn’t get bumped off! The top tier of this cake was a 6″ round, so I took my clean 6″ round pan, centered it and pressed it down onto the bottom tier to leave an impression. That way I’d know where the top tier was going to sit. When I stack tiers, I use bubble tea straws. If you aren’t familiar with them, they’re just really fat straws… see that regular size white straw laying next to them for a comparison. First, you’re going to push a bubble tea straw into the cake just inside the circle impression you made on the cake. You can’t see the impression in this pic because I forgot to do it until after I pushed in the first straw, but imagine it’s there! Most bubble tea straws have a pointed end and a flat end… put it in flat end down. Note: for each tier, you’ll need approximately the number of straws equal to the cake size (in inches) you’re putting down onto them. That’s about as clear as mud, huh? Let me be specific. For this cake, we’ll be stacking a 6″ cake on those straws, so we’ll need approximately 6 straws to support it in the cake below. See? 6 inch cake above = 6 straws below. Clearer? Okay. 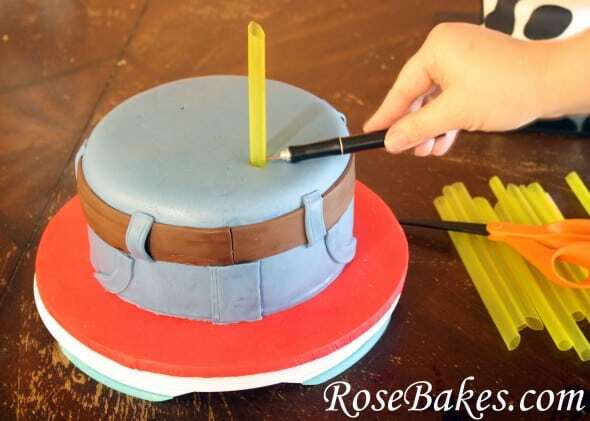 Now, once you have a straw pushed in, take an Xacto knife and mark the straw level with the top of the cake. I poke a little slit in it to be sure I can see it. Also, if you’re cake is un-level at all, try to put the straw in the highest area. Then cut the amount of straws you need equal to that length. So I took that first straw, cut it, then used it to measure and cut five more of the same length. I didn’t get a picture of this step… sorry. Okay, so now you’ll space those straws out, usually about 2-3″ apart and poke them into the cake part-way. I ended up only using five here, but that’s okay. I did say “approximately”. Anyway, I usually leave them sticking out just a couple of inches. Can you see how now they’re all inside the impression line? Then set the cake down on top of the straws, be sure it’s centered and let it sink down. Larger tiers will go down on their own… smaller tiers sometimes need help. Bonus tip: This is not a super important step with fondant cakes where you can touch the cake without damaging it, but this is a super helpful method if you’re stacking buttercream. You can lift a buttercream cake from underneath (with a large spatula if necessary) and set it onto the straws, then gently move it around by holding the bottom to get it centered… then it sinks down without you leaving fingerprints all in the frosting! Okay, now you need to make sure you’re level. Once again, this is not life or death important in a small two tiered cake. But if you’re stacking three or four tiers? You’ll want it level! When I’m stacking tiers (no matter how many), I check for level with each addition so I’ll know where the problem is. If you’ve already stacked four tiers and find out you’re way off, you’ll have to go back and check each one to find the problem or problems. If you check at each addition, you’ll catch the problems before moving on. So if you get to this point and you’re not level… you have a couple of options. One thing that works for me might seem like cheating. 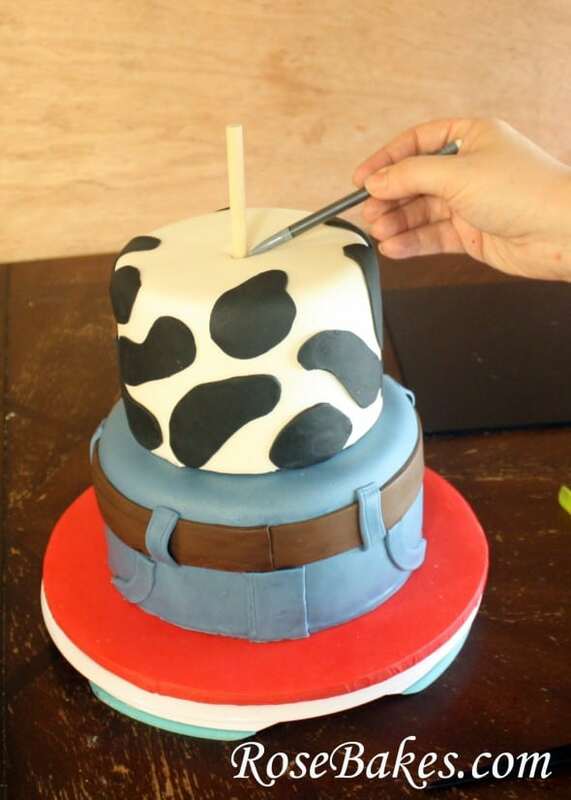 I’ll take the top tier off and I’ll take a piece of fondant and just lay it on the low area to give it some height. 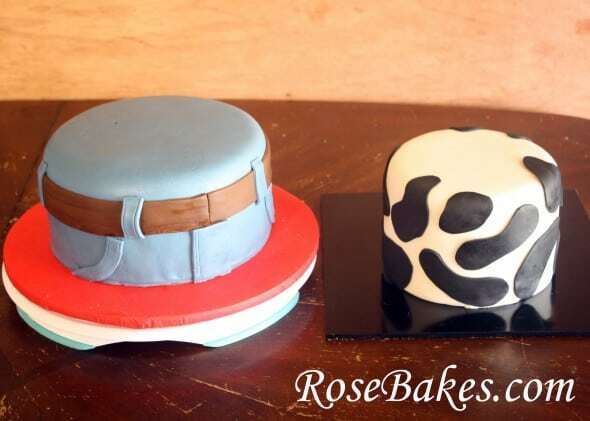 If you’re only slightly off, the extra thickness of fondant there might be just enough to level you out. 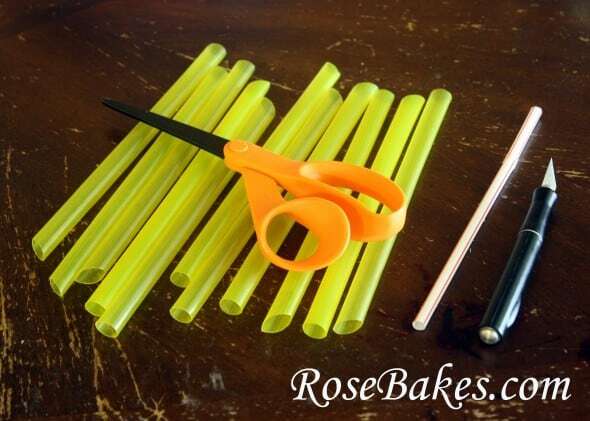 If it’s way off, or you want to do a more thorough job, you’ll need to remove the top tier and then redo the straws. Maybe you accidentally cut one too short, or maybe your top tier cake wasn’t level on it’s own and you’ll need to compensate for that by added a taller straw beneath it. Once you have all that worked out, it’s time to dowel the cake. Yet again… this is not totally necessary for small cakes, or cakes that aren’t traveling very far, but I highly recommend it in most situations! I usually buy 1/2″ wooden dowel rods at Walmart. I sometimes buy larger ones for 4 tiered cakes, like the huge Buttercream Roses Wedding Cake, but generally half an inch is enough for “regular” size birthday cakes. I missed a couple of pics here, but I sharpen my dowels with a regular ‘ole pencil sharpener to get a good sharp point on one end. Then I push it into the cake and give it a good amount of pressure to allow the dowel to grab into the board beneath just a little. You may have to hammer on it a bit to get it to go through each of the cardboard rounds beneath each tier, but it’s not hard to do! Then I take a pencil and mark the spot where it will be level with the cake. You could also mark this with your Xacto blade, but sometimes it’s hard to find the mark on wood. Pull the rod back out and cut it off at the marked spot. I use side-cutting pliers for this, or you could use a saw of some sort. Once it’s cut and the edge is smoothed a bit, I push it back into the cake and that’s it… it’s stacked, doweled and secure! Then I put on the finishing touches and delivered it and a coordinating smash cake!! 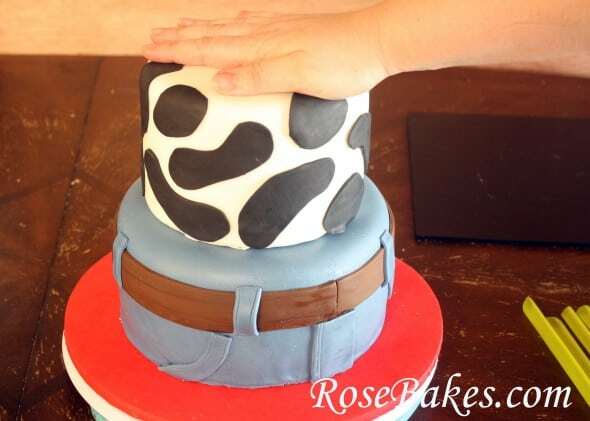 Updated: I’ve added a tutorial for How to Make a Cowboy Hat Cake Topper! FMM Ribbon Cutter for the belt, belt loops, etc. Did I miss any details? 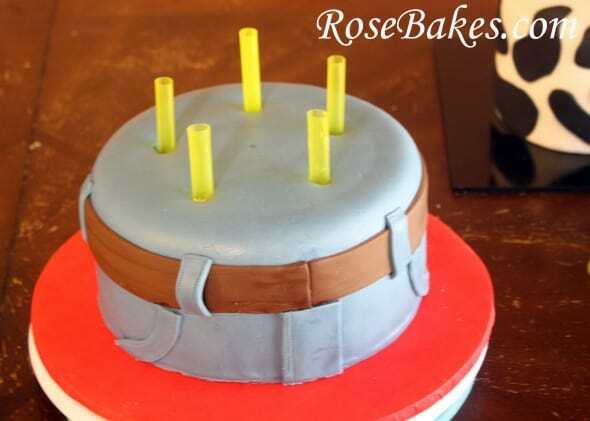 Do you have any questions about this cake or the tutorial? Please leave them in the comments! Thank you so much for leaving a comment! Notes like this really encourage me and just make my day!! I’d love to see a picture when your done!! Best of luck! How did you get the straws to go thru the second tier with the cardboard underneath or did you take it off before you placed the tier? The straws are only as tall as each tier. The only thing that goes all the way through the cake is the dowel rod and it’s sharpened so that it will go through the cardboard! I hope that helps!! 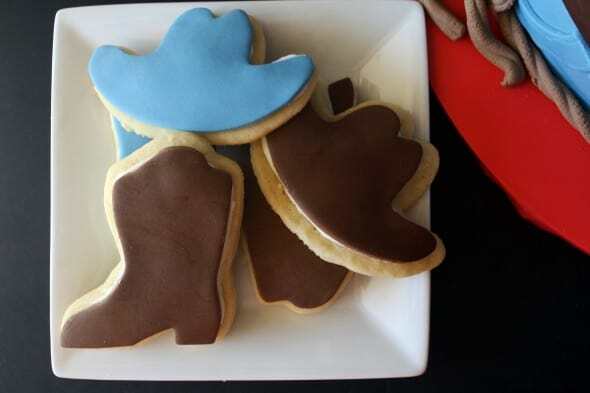 Love these cakes! 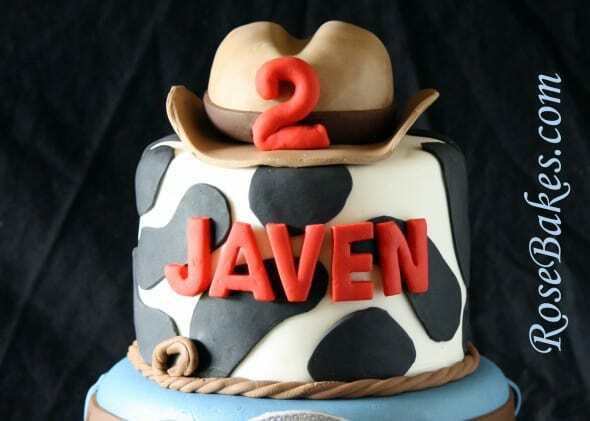 Would you mind sharing how you did the awesome cowboy hat on these cakes please? Thank you soo very much!!! 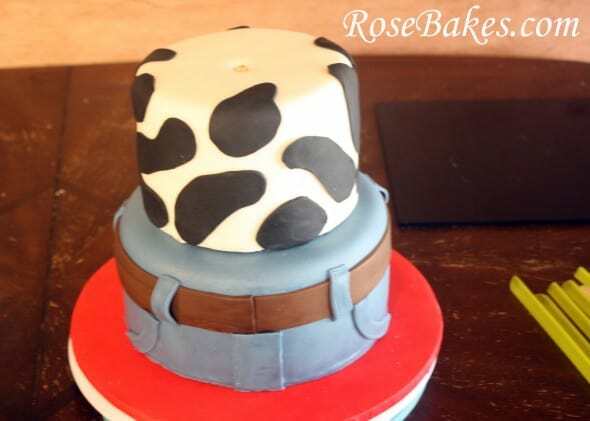 Have you got any instructions on making a fondant or gumpaste cowboy hat? I’m desparate! Have a cake coming up next week! It isn’t going to be a large one –just small enough for a 6 inch top tier with a number up there also! I’m a little confused about stacking. It looks like the only thing supporting the top tier is the straws, but then I read in a previous comment that there was in fact a cardboard round also supporting the top tier on top of the straws. I’m assuming you cut the straws the same height as the bottom tier then place a cardboard round on top of that and then place the top tier on. Am I right? Thanks you the help. Your posts are an inspiration!!! 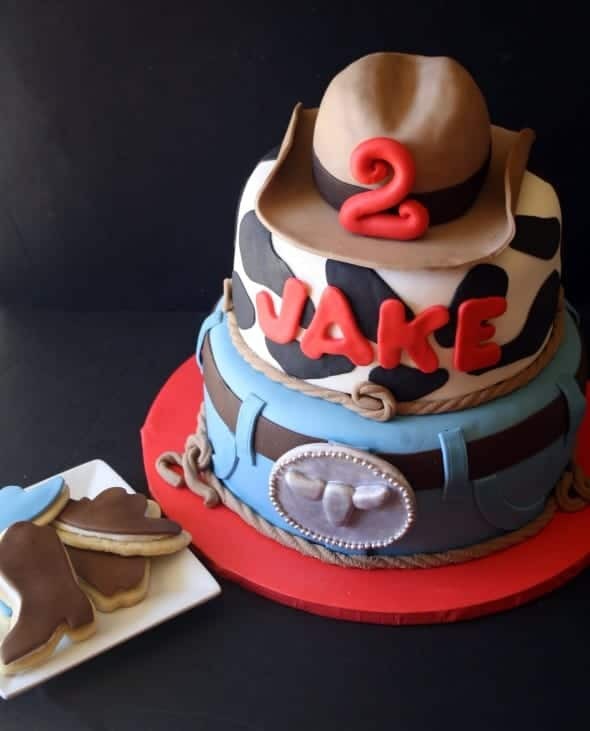 Thank you.. and I’m sorry about your confusion.. it is noted near the top of my instructions, but I put every tier of cake on a cardboard round when I put it together (stack it, fill it, frost it, cover in fondant, etc…. all done on a cardboard round!). I hope that helps! Yep, totally blew by that. Sorry!! Thank you sooo much for this tutorial! You make it look so easy. It is so much easier with your explaination and pics! 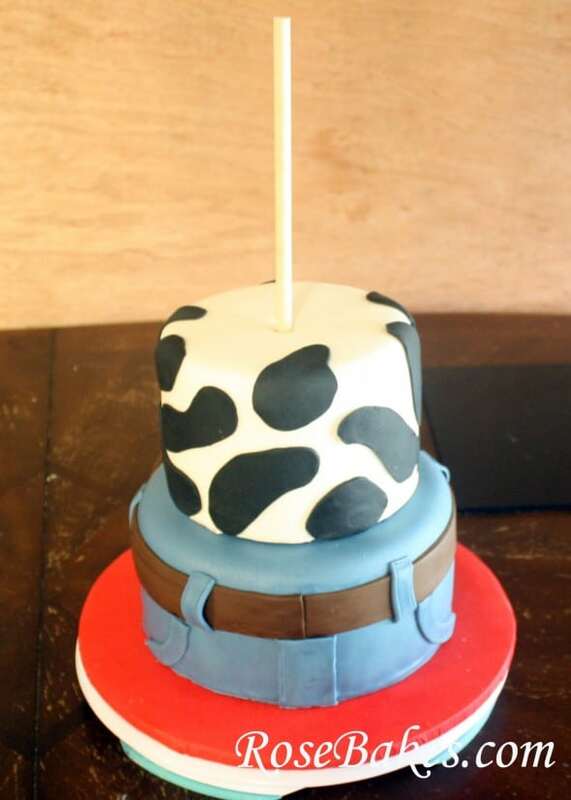 A cake board under the cow boy hat or is it just placed on top like a topper? How do u make it stay on top firmly with out falling of? 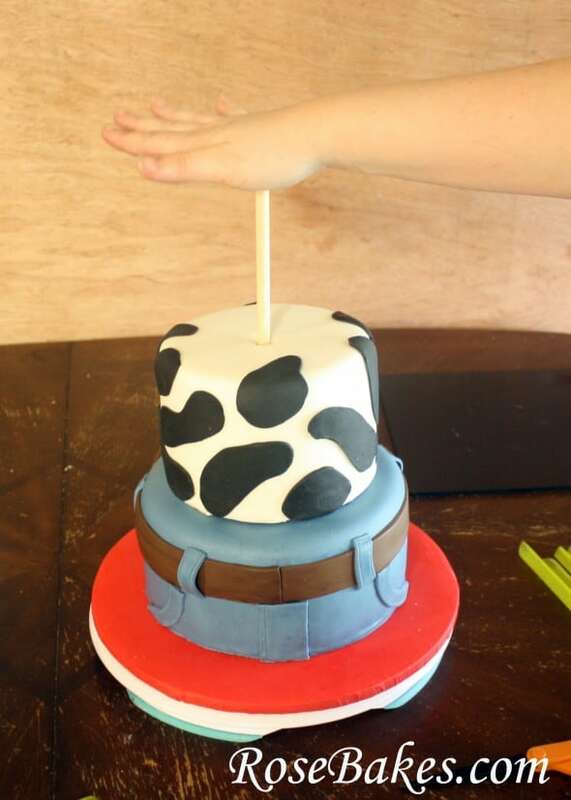 I kept my dowel long enough that it stuck out of the top of the cake by 1-2″, then I pushed the hat down onto it. It did not have a cake board under it. Thank you for sharing your amazing talent! I’m pretty new to the cake world but I love it so much! 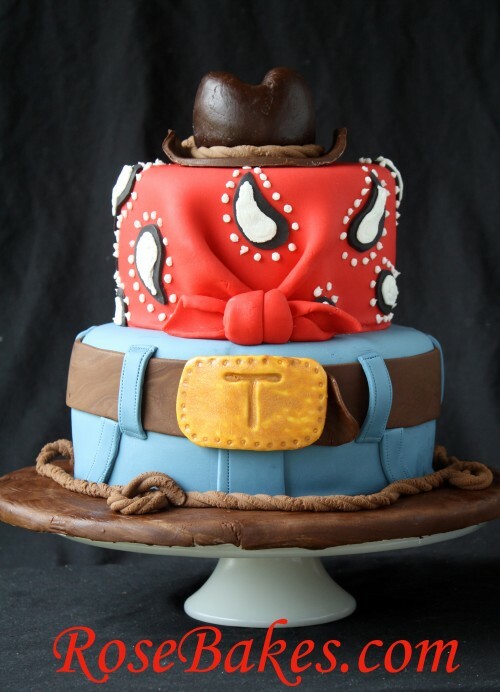 I’m making a cake very similar to this one and I appreciate all the great pictures and details!! Just two follow-up questions this time :). Which x-acto knife do you recommend? I followed your link over to Amazon, but then I see there’s a #2, a z series… If I’m just getting one right now, which one would you recommend? Thanks! Also, the link to the florist wires you use in the exploding cake for the stars – just confirming – it’s the 26 gauge ones? They’re pricier than I would have expected – I just want to make sure that’s right… It was either $5 and $10 shipping from one site, or $30 for 50 from CK products… Thanks for your help!! Xacto Designer Series (mine is black), and I use a #11 blade. Also, I use 22 gauge wire and I like to get them at Country Kitchen Sweetart here: http://www.countrykitchensa.com/shop/cake-decorating-supplies/22-gauge-white-6-covered-wire/38/756/205/634166/ Since I place HUGE bulk orders, I really don’t know how the shipping works out for individual products. But here’s another option on Amazon… #22 Floral Wire. First up, I just got my flirty apron! It really is super cute, can’t wait to try it out in the kitchen. I also ordered the wires through your country kitchen sweet art link – even with paying for shipping it’s still a better price than the Amazon options (with Prime no shipping). So thanks for that! I’m looking forward to trying out your technique for my daughter’s upcoming birthday cake. Finally, with regard to the knives – I see that the ones you prefer nowadays are technically disposable. Do you really dispose of them after one use? And then every 10 cakes or so need to buy more?? Or are they good for a while…? How come you switched to these? More sanitary? Or because every time you use a new one it’s a super sharp blade again? Thanks for all your patience with my questions! I really adore your blog – I made another batch of your MMF last night and it looked GREAT. I was never willing to try it until your tutorial :). So thanks again :). 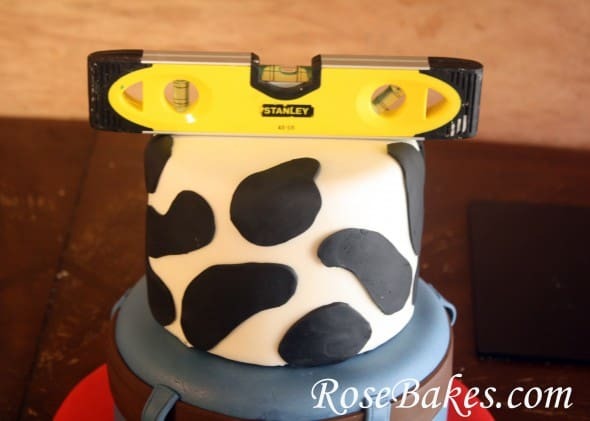 Hi Rose, do you put buttercream between each tier to act like glue for the tier above it to stick to? Or is that not necessary if you’re using the dowel? Also, for a 3-tiered cake, when do you stick the straws in the middle (second) tier – AFTER you’ve already put the second tier on top of the first, or before? Just reporting back to you Rose on my first auccessful three-tiered cake — thanks to you!! Your dowel technique was AMAZING. It alleviated so much stress – I didn’t have to worry about tiers slipping during transport – they didn’t BUDGE! Thank you, thank you!! Hi Rose. I just want to make sure I am understanding this correctly. The bubble straws are so the layers of your cakes don’t shift around, and the dowel is so each stacked cake doesn’t move around. Correct? The bubble tea straws hold the weight of the higher tiers off the lower tiers. The cake actually sits on the straws vs. the cake sitting on the cake beneath it! Does that make sense? That way if you have 3 or 4 tiers (or even just 2), the bottom cake doesn’t start to smush or collapse under the weight of cake stacked on top of it. Yes, that aspect makes sense. Although, I am still confused. Sorry. 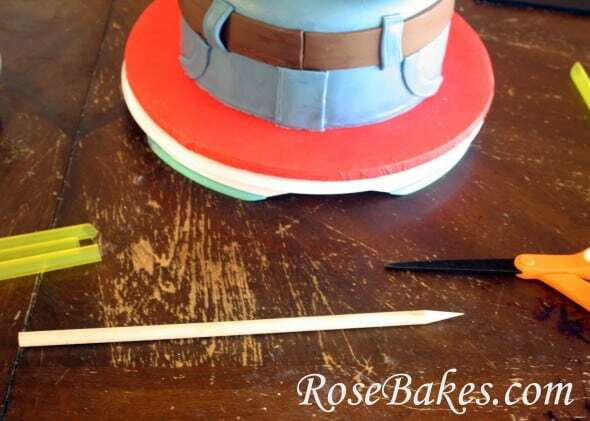 Hey Rose, I was wondering how you go about doweling a cake that does not have a topper on it? What is there to cover the dowel at that point? I usually take my cakes and assemble them on site but would like to try this and was wanting to know about that. Thanks! I usually just fill in the hole with a tiny ball of fondant! I was wondering if I have to make the cardboard rounds or if I can purchase them? and if I can purchase them, could you tell me where? I buy them at brpboxshop.com. I really did find your tutorial very helpful and easy to understand. I’m also admiring your cakes design. I just have a question; how to cut the cake around the tea straws when serving? Is it ok to cut around them and leave it visible to the crowd or is it not supposed to be that way? I just pull them out as I come to them. No biggie! Hi Rose! How would you stack a cake without using a topper? 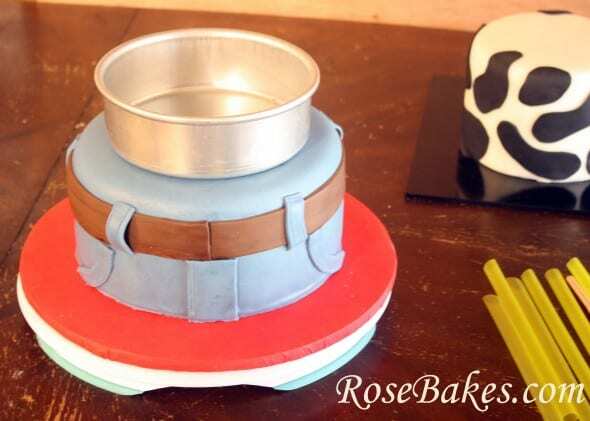 I cut the dowel rod about an inch shorter than the cake, drive it in, then cover the hole with a tiny ball of fondant or fill it in with buttercream! Thanks for stopping by! 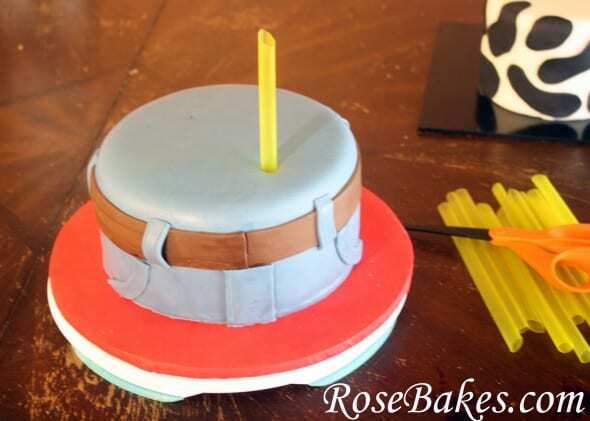 Do you flip the wooden dowel, pointy side up after you have made the hole through all three layers, then cut the point off when you reinsert it into the cake? Just wondering if you leave it pointy side down or use a flat bottom for the bottom part of the cake. I drive the pointy end all the way into the board and leave it there for extra support. I never pull it out after it’s in the cake because that would make it more unstable. Hi Rose! Love your site! I just have a question…you mentioned in your instructions to set the top tier down on top of the bottom tier and “let it sink down”. But don’t you have a cardboard round under each tier? How does it sink down onto the bubble tea straws with the cardboard underneath it??? The bottom straws aren’t pushed all the way down into the cake, so they sink down into the bottom cake from the weight of the cake being set on top… does that clear it up for you? While I have you, can I ask you another question? The three-tiered cake I mentioned I made before was buttercream and when taking it apart to cut it, was quite the mess, despite having cake rounds under each tier and all. I had to take out all the dowels which was a mess in itself. 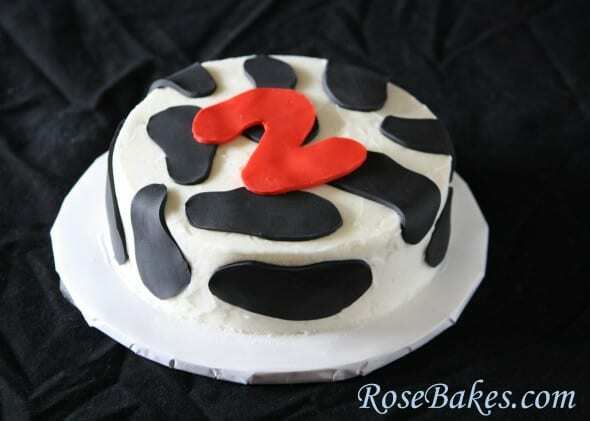 I was told the cake looked and tasted amazing it but I’d love to know how to do it in a cleaner manner next time. Do you have any helpful hints as to how to disassemble tiered buttercream cakes cleanly? Thanks for any advice! Got it! I’ve read a few blogs that said to separate each tier first and then cut but that makes sense. When yout start cutting from the top though, do the lower tiers not get smooshed from the pressure of cutting? No – it doesn’t take that much pressure to cut a cake and the bubble tea straws (if done correctly) support the cake above them so that the cake itself bears no weight from the cake above. Awesome! Thank you again for such quick responses! I can’t get enough of your blog and tutorials! Are bubble tea straws the same thing as milkshake straws? I just made a 4 tiered wedding cake and used milkshake straws because the Wilton plastic dowels were so hard for me to cut and get level. But I was a nervous wreck that the cake would collapse. It worked great but I’m just unsure if I just got lucky. A local cake supplier who does a lot more work than I do chastised me for not using the new support system with plastic rods and plates. UGH! Amanda – I’m not really sure. The bubble tea straws I use are about 1/2″ diameter. If yours are smaller, I don’t have any experience with that. But I can say – I’ve stacked cakes as tall as 6 tiers and never had any problem with bubble tea straws. The only times I used a more complicated support system was when there were gaps between the tiers where I had to use plastic columns.